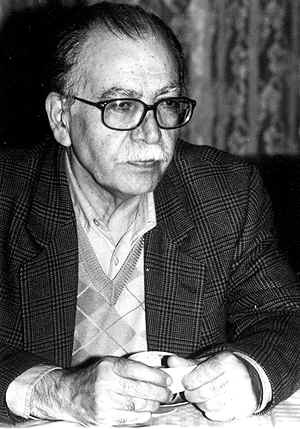 Ali Ashraf Darvishian (Persian: علی‌اشرف درویشیان‎‎; 25 August 1941 – 26 October 2017) was an Iranian story writer and scholar. After finishing teacher-training college, he would teach at the poverty-stricken villages of Gilan-e-Gharb and Shah Abad (nowadays called Islam Abad). This atmosphere is featured in most of his stories. His own life situation, as well as the experiences that he had from his teaching in those poor areas, was the inspiration for his literary works and also made him a critic of the political and social situation of Iran. Later, he moved to Tehran and continued his studies in Persian literature. As of 2006, Ali Ashraf Darvishian was in Australia as a guest of the Iranian Centre for Democracy and presented a number of lectures on a broad range of social and cultural issues. Marjane Satrapi, an Iranian-French author, mentions Darvishian in her graphic novel Persepolis. She considers him her favorite childhood author, recalls going to his clandestine book-signing, and describes him as "a kind of local Charles Dickens". He died at a hospital in Tehran, on 26 October 2017. One of his books is a collection of short stories titled "Az Nadarad Ta Darad". Nadarad (Doesn't have) is one of the titles of the book. It is named after the family name of the main character of the story, which foreshadows absolute poverty of all the characters in the story and mostly Nadarad (meaning Doesn’t have) family. From the point of view of Marxist critical approach, one of the many perspectives through which a literary work can be analyzed, poverty can be said to have been the result of social conflict and class struggle, because of the fact that people were not aware of how they have unconsciously accepted the subservient, powerless roles in their society that have been prescribed for them by others (false consciousness). In this story, Nadarad family are the representative of the proletariat, while Mash Ghorban represents the bourgeoisie. Niaz Ali, child of family, chooses to go to school in order to promote his class in society, and he has no plan of protesting against the cruel social structure. ^ "علی‌اشرف درویشیان درگذشت". BBC Persian. Retrieved 26 October 2017. ^ "صوت/ داستان شنیدنی- نیاز علی ندارد از «علی اشرف درویشیان". This article about an Iranian writer or poet is a stub. You can help Wikipedia by expanding it.